The M1919A4 is an American .30 cal medium machine gun. The M1919A4 is the most mass produced version of the famous M1919 Browning machine gun, which entered service just after the First World war, in 1919, and is still in service with some countries to this day. 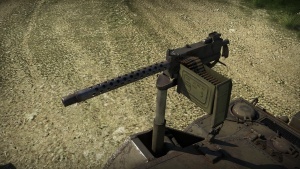 In game the M1919A4 is ubiquitous in the American ground forces tree, being found as the commander's gun on early American tanks (most later ones are equipped with the Browning M2HB (12.7 mm); as well as the co-axial machine gun on most American tanks from the start of the tech tree, until Rank 5. The gun also features heavily among American tanks in other nation's tech tree's. Being only a 7.62mm machine gun, it is largely ineffective against all but the most weakly armoured, or open cabin, vehicles. The M1919A4 features as the commander's machine gun on a number of Rank 1 & 2 tanks in the American tank tree. It is also used as a co-axial machine gun on most Rank 1 - 5 American tanks. The gun is also present on American tanks in other nation's tank trees. The M1919A4 is a fairly standard 7.62mm medium machine gun. The M1919A4 can only be equipped with one ammo belt consisting of one Armour Piercing (AP) bullet, followed by one Tracer (T) bullet. Neither bullet has much penetration (maximum of 10mm), however the AP bullet performs much better than the tracer bullet. The M1919A4 performs identically to its British counterpart the L3A1. Like the L3A1 it suffers from a somewhat low rate of fire compared to other , similar, machine guns such as the BESA and L8A1, firing 100 rounds per minute less (500 compared to 600). The weapon also has slightly worse penetration than the BESA (7.92 mm), which is the main co-axial weapon of British tanks., although does get a larger ammo belt. Due to the very low penetration of this weapon it is largely ineffective against enemy armour (although you may be able to penetrate some vehicles with extremely thin armour). The gun is primarily useful for incapacitating exposed crew members in open topped vehicles (although there are few such vehicles at the battle ratings this gun is found at). The gun can also be used for ranging on some vehicles, as well as marking enemy vehicles and obscuring the view of enemy players (shooting at their gun sight). You can use the gun against aircraft however it does minimal damage, and being co-axially mounted on most tanks can often not be brought / kept on target against aircraft. The M1919A4 is the definitive and most mass produced version of the famous M1919 Browning machine gun. The history of the M1919 can be traced back to the earlier M1917 Browning machine gun, a water-cooled .30 cal heavy machine gun. The M1917 was originally designed by John Browning in 1900, with a prototype being made in 1910. The design was left until the United states entered WW1 in 1917, Browning submitted his design to the military and it proved to be highly reliable. The US military adopted the gun as it's principal heavy machine gun in 1917 and the weapon saw limited service (due to low initial production rates) towards the end of the First World War. The weapon would go on the serve in the Second World War (alongside the M1919 and M2), as well as in the Korean War, and despite being phased out in the 1960s in favour of the M60, saw limited action in the Vietnam War. Though the M1917 proved itself to be a good weapon, the heavy water-cooling shroud and equipment limited its portability and made it vulnerable to damage. Browning desired to make a gas-operated and air cooled machine gun and in 1919 created the M1919 machine gun, based off of the M1917 design. Chambering the .30-06 Springfield (7.62x63 mm) round, it was originally designed for use on tanks, a role for which the M1917 was poorly suited due to its weight and relative fragility. The weapon proved popular, with many variants being produced for use by infantry, tanks, aircraft and naval vehicles. The M1919A4 version is seen as the definitive version of the gun, produced from 1936 onwards. The weapon featured an increase in barrel length from 18 inches to 24 (in order to produce more recoil and tackle reliability issues with the earlier versions, caused by a lack of recoil force to consistently cycle the guns mechanism). The variant was designed for use on both vehicles and infantry tripods. After WW2, the M1919 remained in service with the United States and many other nations. It was used by the United States in Korea and Vietnam, although from the 1950s onwards it began to be replaced with newer general-purpose machine guns such as the M60. Many M1919s were re-chambered to fire the 7.62×51mm NATO round and remained in service with the United States until at least the 1970s. Some countries still operate variants of the M1919 firing the 7.62 mm NATO round to this day. This page was last edited on 18 March 2019, at 18:31.